Calling out the upper middle class. 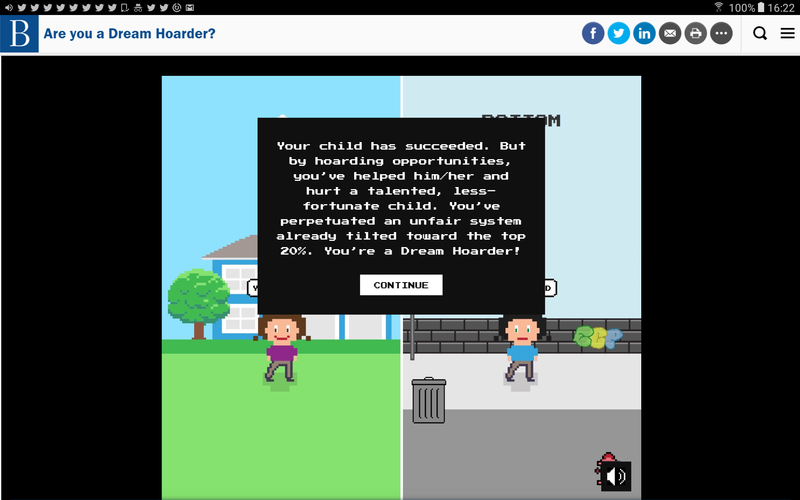 I just took The Brookings Institution’s Dream Hoarder test, although they call it a game. It sure doesn't feel like a game when you give the “wrong” answer. The right answers make you a virtuous progressive willing to sacrifice privilege, while the wrong ones indicate you're part of the problem. Question number one: “Your family lives in a single–family home in an upscale neighborhood. New legislation could change the zoning code to allow multi–family housing, which often leads to an increase of lower–income residents. Will you support the legislation?” Answer “no” and you're told that this prevents diversity, deepens the wealth divide, and increases gaps in school quality. Question number three asks if you’d help your child, who wants to attend law school, secure a summer internship at your friend’s law firm. If you would, that means talented but less fortunate students won't get the position. “You're a Dream Hoarder!” you're informed. The Dream Hoarder test is flawed, but it raises some interesting issues. The testmakers should’ve spelled out exactly how much the proposed zoning legislation would drop your property value if they want to play it straight—put a number on it so you can see what sort of sacrifice you need to make to get their approval. Moreover, diversity isn't everyone's first priority, even though progressives fetishize it. “Our diversity is our strength” is merely a bromide used for political purposes. Diversity isn't necessarily a goal to seek, but rather a reality that must be dealt with so people of various persuasions can live together in harmony. As for you giving your child with the mediocre intellect a leg up with a donation, that's a thornier issue. Legacy admissions, which are affirmative action for the rich, shouldn’t exist in the first place. The U.S. is allegedly a classless meritocracy, but many parents are able to buy their child's admission into top schools with what's essentially a bribe. The irony is that elite universities like Harvard, Stanford, and Princeton grant heavy preference to legacy admissions while pretending to promote diversity. It's a big lie. The third question, however, is clear-cut. Although Brookings isn't concerned with this side of the issue, nobody should ask a friend to give their child a summer internship for the simple reason that real friends don't make such requests. Asking means the friendship is at stake if the answer’s “no,” so it's coercive. You also shouldn’t be giving your child the message that they’re entitled to things they didn't earn. The most serious flaws with the Dream Hoarder model are its $120,000 combined household income yardstick and the one child assumption. That sum in San Francisco or New York gets you nothing close to what it does in Columbus or San Bernardino, and the average mother has 2.4 children, not one. 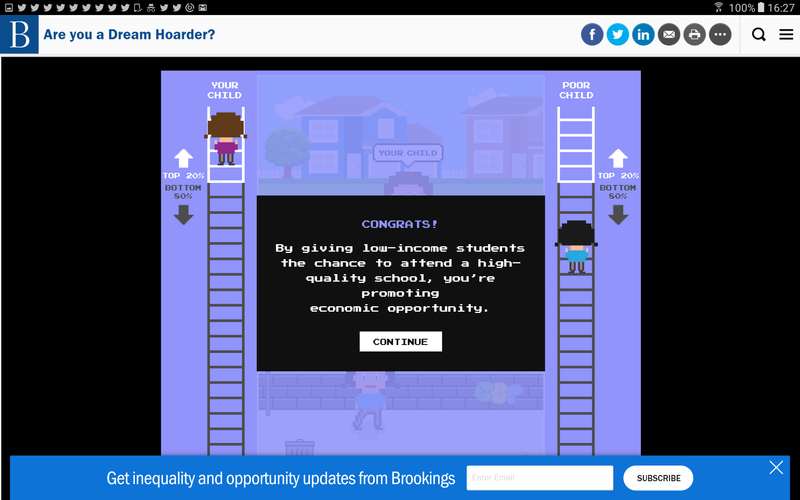 A couple living in Manhattan with three children near college age isn't in the favored fifth, yet Brookings is telling them they must act like they are. This metric lacks any semblance of nuance. One Percenters seeing the Dream Hoarder argument would feel relief. They control 90 percent of American wealth, and are set to receive tax breaks from the Trump administration, yet they have the Brookings Institution putting other middle-class people on guilt trips while letting the true elite totally off the hook. Richard Reeves bemoans the fact that the children of the upper middle class also become upper middle class, but parents are hard-wired to work to advance their children's economic future. Reeves is correct in pointing out that well-off people using their influence unfairly is bad for society, but to tell one group they're responsible for killing the American dream is a ludicrous oversimplification.